Running a competition on Instagram? Follow these 11 rules! So, you want to run a competition? Perhaps people win something? Perhaps they win tickets to an event you are holding? Or a prize for the best submitted image? Or perhaps their prize is that their submitted image (if it’s a photo contest) gets featured on your channel? This is a great way to give your Instagram some interactivity, and hopefully – the holy grail in social media – “User Generated Content” – eeek – such an exciting thought! But the worry? It will be all tumbleweeds. Your contest will fall flat on its face. It will be an embarrassment which no one dares discuss. So, I wrote this post to help prevent this. You need a good bio and some quality activity. If you are setting up Instagram for the first time, make sure there are at least 20 pictures there so when people look at e originator of the competition they see a profile which has great images and which are relevant to your business. You may want to temporarily change your bio to have a link to the page on your website (or a blog post) about the competion. Depending on the number of people you have following your channel and the amount of engagement you currently have, lower the barrier to entry. So, make entering the completion easy and low pressure. Consider these two options – the top one has an extremely high barrier to entry and the lower one is easier. Below are 2 other posts I have found which show the different ways it can be done. Lipsmacker has chosen to make it harder, and then Carlig just wants you to “regram” the image. Instagram is a photo sharing app. So, quality of images will rule above all else. If you don’t have amazing images in your feed, you will be compromosing. Repost or Regram – but don’t steal! Your instagram is for your pictures, or the pictures of others, but never upload images which don’t belong to you – unless you credit the original person. I recommend an app called “Repost” which lets you easily share other people’s instagram posts – and it gives them credit in a nifty side bar! Love this picture so I am #Reposting @ollieverschoyle with @repostapp. If you aren’t yet famous on Instagram, make sure you ask your inner circle (perhaps people in your office) to participate in the contest, submitting images. This doesnt mean they get to win! This way, if people were to look at the hashtag, they would see the other mages are not all from you but from a few others. Post once a day on Instagram so your channel is active and continues to grow in followers organically. The quality of the images you post makes a difference to the amount of followers you amass – as does other things – like who you follow, if you comment and “double tap” other profiles, how you promote your Instagram, and how well known you are. You should be posting a variety of different types of images, so your pictures are not all about the completion, but every few posts you mention the competition. Put text onto images to remind people about the competition. This will grab their attention and they may read the caption or click on your profile to find other images and see what’s going on. Merci encore aux participants d’hier! 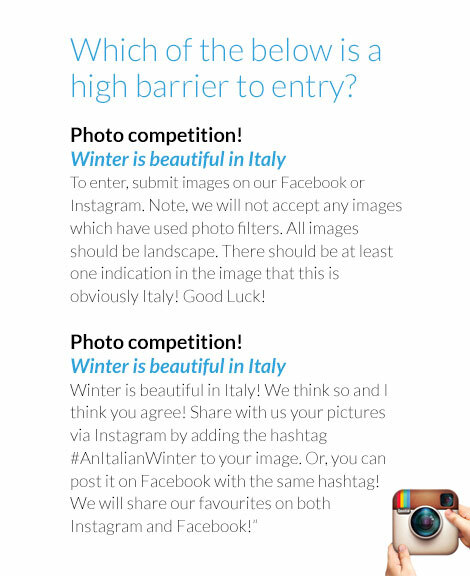 Use captions that give a bit of info about the picture, and also excited and enthusiastic captions about the competion, eg “not long now” and “we already have 5 submissions hooray! Unless you think the winner is super private and doesn’t want people to know they won, make sure you share the winning person’s photo and instagram name. You shouldnt be seeing this as a one off. Each time you do a contest you will learn and can improve the next time. So, think ahead, and consider how in the next 6 months you could run 2 or 2 competitions, or even more! This is only the beginning. As long as you keep learning and improving, you will get better and better results.